Accurate, dependable and stylish; the Ohaus Triple Pro mechanical balance offers it all: The superior quality and durability you’ve come to expect from Ohaus, plus all the extras to satisfy every classroom activity requiring a balance. Just like the original Triple Beam balance from Ohaus, the Triple Pro balance gives you the confidence to know you have the accuracy and convenience of a toploading balance while allowing your students to gain hands-on experience through manipulation of the poises, attachment weights and the rod & clamp assembly (all included). 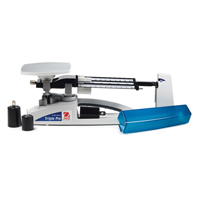 The Ohaus Triple Pro balance is the perfect learning tool to help students visualize mass measurement principles and to emphasize a hands-on approach to learning. balanced to allow for effortless movement around the classroom. a Kensington-type lock (cables sold separately). of bending the damper vane. • Backed by an incredible 10 year limited warranty that only Ohaus can provide.